(TibetanReview.net, Apr15, 2015) – Chinese authorities in Chone (Chinese: Zhuoni) County of Kanlho (Gannan) Prefecture, Gansu province, had conditionally released on Mar 20 a senior Tibetan Buddhist monk whom it had secretly detained and disappeared on Mar 9 over a list of alleged anti-China activities, said Radio Free Asia (Washington) and other reports Apr 13. The Chinese were said to have suspected the monk, Jigme Gyatso, 39, chant leader at the Chone Dethang Monastery, of planning to lead a protest on Mar 10, the 56th Tibetan National Uprising anniversary. He was also said to have been accused of being involved in “activities to split the motherland” and sharing with others images of the Tibetan national flag as well as banned information with other groups over social media through his mobile phone. 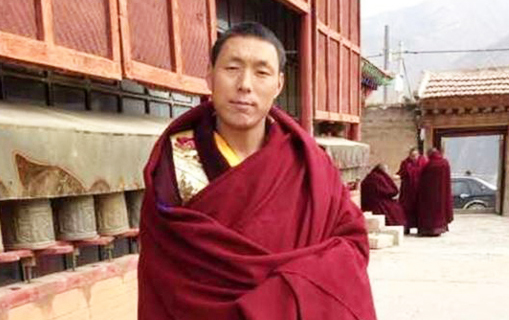 The monk had disappeared after he left his monastery for Labrang Tashi Khyil Monastery in neighouring Sangchu County on Mar 6 to attend a long-life prayer service being held there for his religious teacher Dethang Khen Rinpoche. It was only on the day of his bail that he was learnt to be held in the Chone County police detention centre. The reports said Jigme Gyatso will be re-arrested and will have to stand trial once he completed his current post as the chant leader of his monastery next year.